While some of America is in a heavy flirtation with white ethno-nationalism, the well-meaning parts of white America could stand to tweak our understanding of how to reach for and achieve equality. This week, a panel discussion on the topic of diversity and equity will take place, focusing beyond multicultural inclusion to how full equity will transform society for the better and mean collective liberation for all. The event's panelists are landscape architect, writer, and critic Mary Adelaide Scipioni; Catalyst Consulting owner and founding board member of Rochester Accessible Adventures Luticha Doucette; UR associate professor and associate academic director of the Susan B. Anthony Institute for Gender, Sexuality, and Women's Studies Tanya Bakhmetyeva; and political activist, artist, writer, and filmmaker Mara Ahmed, who will also serve as moderator. 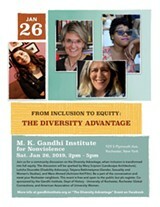 "From Inclusion to Equity: The Diversity Advantage" takes place on Saturday, January 26, from 2 to 5 p.m. at the M.K. Gandhi Institute for Nonviolence, 929 South Plymouth Avenue. 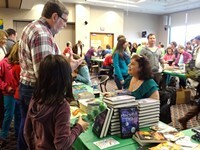 Admission is free, but registration is requested. gandhiinstitute.org.